A Vogel Avena Sativa plant, better known as the oat plant, has been used for centuries as both a food and a herb. It is the green leafy parts of the oat plant which are used to make Avena Sativa tincture, rather than oat grain which is commonly used as food. A Vogel Avena Sativa herb contains a number of plant chemicals including a substance known as gramine. The amount of these plant substances is highest just as the Avena Sativa plant is about to break into flower and the seeds begin to form. 20 drops 2 or 3 times daily in a little water. 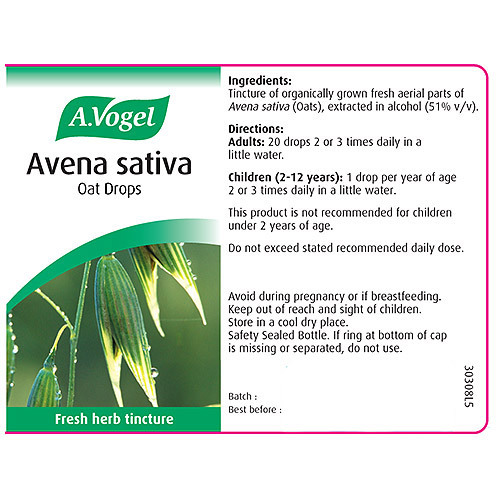 Below are reviews of A Vogel Avena Sativa Oats - Tincture - 50ml by bodykind customers. If you have tried this product we'd love to hear what you think so please leave a review. 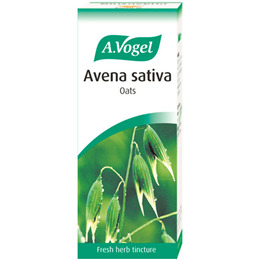 A Vogel Avena Sativa plant, better known as the oat plant, has been used for centuries as both a food and a herb. Its the green leafy parts of the oat plant which are used to make Avena Sativa tincture, rather than oat grain.